A blessing (also used to refer to bestowing of such) is the infusion of something with holiness, spiritual redemption, divine will, or one's hope or approval. The modern English language term bless likely derives from the 1225 term blessen, which developed from the Old English blǣdsian (preserved in the Northumbrian dialect around 950 AD). The term also appears in other forms, such as blēdsian (before 830), blētsian from around 725 and blesian from around 1000, all meaning to make sacred or holy by a sacrificial custom in the Anglo-Saxon pagan period, originating in Germanic paganism; to mark with blood. Due to this, the term is related to the term blōd, meaning blood. References to this indigenous practice, Blót, exist in related Icelandic sources. The modern meaning of the term may have been influenced in translations of the Bible into Old English during the process of Christianization to translate the Latin term benedīcere meaning to "speak well of", resulting in meanings such as to "praise" or "extol" or to speak of or to wish well. 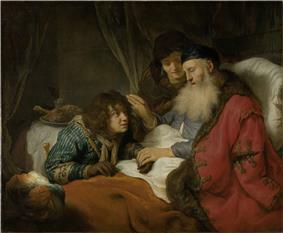 Isaac Blessing Jacob, painting by Govert Flinck (Rijksmuseum Amsterdam). Position in which a Jewish kohen places his hands and fingers during the Priestly Blessing. "To be blessed" means 'to be favored by God'. Blessings therefore are directly associated with God and come from God. Thus to express a blessing is like bestowing a wish on someone that they will experience the favor of God. "May you have a blessed Christmas", therefore can also be translated as: "May you experience the favor of God during this Christmas period." A curse, at least in its most formal sense, is the opposite of a blessing. Compare charm. In the Bible, blessings and curses are related; the book of Deuteronomy prescribes that obedience to the Law of Moses brings God's blessing. Similar constructions appear in the New Testament, as in the blessings and curses of Jesus recorded in the Beatitudes of Luke 6:20-22. "I will bless you, I will make your name great." May the LORD turn His countenance to you and grant you peace. In Judaism, a blessing (or berakhah) is recited at a specified moment during a prayer, ceremony or other activity, especially before and after partaking of food. The function of these blessings is to acknowledge God as the source of all blessing. A berakhah typically starts with the words, "Blessed are You, Lord our God, King of the universe..." Judaism teaches that food ultimately is a gift of the one great Provider, God, and that to partake of food legitimately one must express gratitude to God by reciting the appropriate blessing. Jewish law does not reserve recitation of blessings to only a specific class of Jews; but it does mandate specific blessings to specific occasions, so that, for example, women chiefly recite the blessing for lighting Shabbat candles. Within Roman Catholicism, Eastern Orthodoxy, Anglicanism, Lutheranism, and similar traditions, formal blessings of the church are performed by bishops, priests, and deacons. Particular formulas may be associated with episcopal blessings and papal blessings. In Roman Catholic, Eastern Orthodox, Anglican, and Lutheran churches blessings are bestowed by bishops and priests in a liturgical context, raising their right hand and making the sign of the cross with it over persons or objects to be blessed. They also give blessings to begin divine services and at the dismissal at the end. In the Orthodox Church liturgical blessings are performed over people, objects, or are given at specific points during divine services. A priest or bishop usually blesses with his hand, but may use a blessing cross, candles, an icon, the Chalice or Gospel Book to bestow blessings, always making the Sign of the Cross therewith. When blessing with the hand, a priest uses his right hand, holding his fingers so that they form the Greek letters IC XC, the monogram of Jesus Christ. A bishop does the same, except he uses both hands, or may hold the crozier in his left hand, using both to make the Sign of the Cross. A bishop may also bless with special candlesticks known as the dikirion and trikirion. When blessing an object, the rubrics often instruct Orthodox bishops and priests to make use of such substances as incense and holy water. Also, formal ecclesiastical permission to undertake an action is referred to as a "blessing". The blessing may be bestowed by a bishop or priest, or by one's own spiritual father. 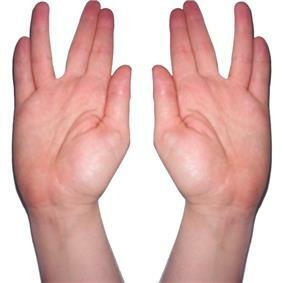 When an Orthodox layperson bestows a blessing, he or she will hold the thumb and first two fingers of the right hand together (the same configuration used when making the Sign of the Cross on themselved), and make the sign of the cross over the person or object they are blessing. In the Roman Catholic Church a priest or bishop blesses the faithful with the Blessed Sacrament in the monstrance during Benediction of the Blessed Sacrament. According to the guidelines given by the Vatican's Congregation for the Discipline of the Sacraments that govern the procedures for liturgical ceremonies, if a Roman Catholic layperson (a lay acolyte or parish administrator, for example) or any non-ordained religious (who is not the superior of the congregation) leads a Sunday service (other than a Mass, which requires a priest to celebrate), such as Eucharistic adoration, the Rosary, or celebration of the Liturgy of the Hours, he or she does not perform rites or sacraments reserved to the clergy and does not solemnly bless the people as a bishop, priest, or deacon would at the end of the service; an alternative format is used instead. In The Church of Jesus Christ of Latter-day Saints, blessings are given by worthy, male members who hold the Melchizedek priesthood. Islam has no clerical caste, and therefore no blessings reserved to specific individuals. Muslims will frequently pronounce "peace and blessings be upon him" when mentioning the name of Muhammad or indeed, any of the prophets. Muslims will also greet one another with a blessing every time they meet and depart (السلام عليكم ورحمة الله وبركاته as-salāmu alaikum wa rahmatul-lāhi wa barakātuh (meaning "may peace, mercy and blessings of God be upon you")). In Hinduism Puja is a religious ritual performed by Hindus as an offering to various deities, distinguished persons, or special guests. It is modeled on the idea of giving a gift or offering to a deity or important person and receiving their approval ("Ashirvād"). During the Puja involves an 'Aarti plate' or 'Aarti lamp' is circulating around a deity or person and is generally accompanied by the singing of songs in praise of that deity or person (many versions exist). In doing so, the plate or lamp is supposed to acquire the power of the deity. 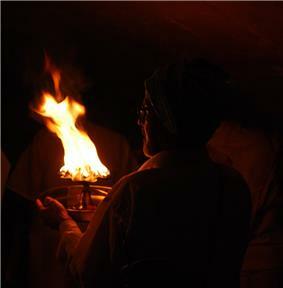 The priest circulates the plate or lamp to all those present. They cup their down-turned hands over the flame and then raise their palms to their forehead - the purificatory blessing, passed from the deity's image to the flame, has now been passed to the devotee. 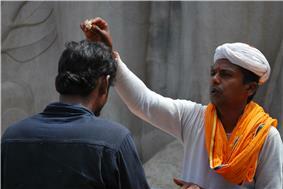 During the naivedya ritual, a devotee makes an offering of a material substance such as flowers, fruits, or sweets. The deity then 'enjoys' or tastes a bit of the offering, which is then temporarily known as bhogya. This now-divinely invested substance is called prasāda, and is received by the devotee to be ingested, worn, etc. It may be the same material that was originally offered, or material offered by others and then re-distributed to other devotees. In many temples, several kinds of prasada (e.g. nuts, sweets) are distributed to the devotees. Darshan is a term meaning "sight" (in the sense of an instance of seeing or beholding; from a root dṛś "to see"), vision, apparition, or glimpse. It is most commonly used for "visions of the divine," e.g., of a god or a very holy person or artifact. One could "receive darshana" of the deity in the temple, or from a great saintly person, such as a great guru. The touching of the feet (pranāma) is a show of respect and it is often an integral part of darshan. Children touch the feet of their family elders while people of all ages will bend to touch the feet of a great guru, murti (icon) of a Deva (God) (such as Rama or Krishna). There is a special link between worshipper and guru during pujas, in which people may touch the guru's feet in respect (Pranāma), or remove the dust from a guru's feet before touching their own head. Another tradition is "Vāhan pujā" (Hindi) or "Vāgana poojai" (Tamil வாகன பூஜை) 'vehicle blessing'. This is a ritual that is performed when one purchases a new vehicle. A blessing can also be a request for permission, as in "gaining your parents' blessing" would consist of having been granted consent. Clergy will normally receive a blessing from their ecclesiastical superiors to begin their ministry. In the Russian Orthodox Church pious laymen would go to a starets (elder) to receive his or her blessing before embarking upon any important work or making a major decision in their life. In the Church of Jesus Christ of Latter-day Saints, a member may receive a special blessing, known as a patriarchal blessing, as guidance. In Spanish, there is a blessing which can be used as a tender farewell, especially from a parent: Vaya con Dios ("Go with God"), also Adiós (A Dios, "to God"), similar to the French Adieu. Blessing is also a term used for marriage in the Unification Church, see: Blessing Ceremony of the Unification Church. In Hawaii anything new (a new building, a new stretch of road to be opened, a new garden) receives a blessing by a Hawaiian practitioner (or Kahuna) in a public ceremony (involving also the unwinding of e.g. a maile lei). ^ a b c d Barnhart (1995:73).